I've been wanting to tackle Love2D's lack of graphical development tools for a while, and since I've started experimenting with the imgui interface library, the goal seems much more realistic. This is my first ever GUI application, and I must say that I'm pleased with the outcome, though it is still rough around the edges and contains some bugs. Until now, I've used Kikito's anim8 as my animation library. But I wanted to write something that would make it extremely simple to pull tiles from a spritesheet using a graphical editor, and quickly pull them into a game. And that is why I wrote Motion. 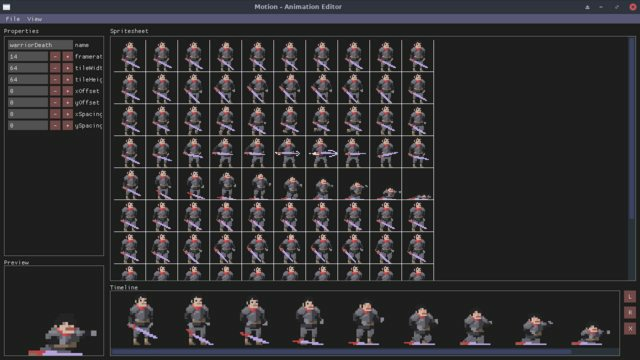 Once you've created an animation file using Motion's graphical editor, loading it into the game just takes a couple lines of code. imgui and luafilesystem must be installed to run the animation editor, but are not required for the motion library. So you as the developer must have imgui and luafilesystem, but you will not need to package it with your game, nor will your users have to install it. Collision editor that can export collidables to Bump. Would be useful for fighters, platformers, etc. where an objects attack hitbox may change throughout its animation state. Please report any issues either as replies to this thread, or on the Gitlab page. This is really awesome! I haven't gotten a chance to use it yet, but it's really really nice to see a new tool especially for something like animation on the scene!